Conceptually the idea was to bring a more open feel to the unit which had an outdated layout, as well as enlargement of the kitchen to compliment the couple’s enthusiasm for cooking and fine wine while creating an actual dining area. The project proved much more complicated than a simple interior renovation as Crown had to creatively overcome layout obstacles for the addition of a powder room and walk-in closet. Existing constraints included a column, chase (piping) locations, and limited room for ADA compliance. Not being able to cut into the floor slab restricted the distance of the new powder room from the existing bathroom for running the sanitary lines for the fixtures. The existing ceiling was also the slab from the floor above, which impeded contemporary options for new lighting. Crown sourced low profile lights, and modified the housing to just use the hat channels with ½” gypsum board to allow new wiring along the ceiling and the installation of LED high hat lighting. Triumphing over the space's encumbrances, Crown was able to incorporate all of finishes desired by the owners. Du Chataeu’s Vernal Collection sprawls the wood flooring throughout. The kitchen is fashioned with Carrara marble slabs for the island and counter top, statuary marble tile backsplash, Rohl Fireclay Shaws Farmhouse Sink with Rohl Perrin & Row Bridge Faucet with a polished nickel side spray, and a Wolf range. 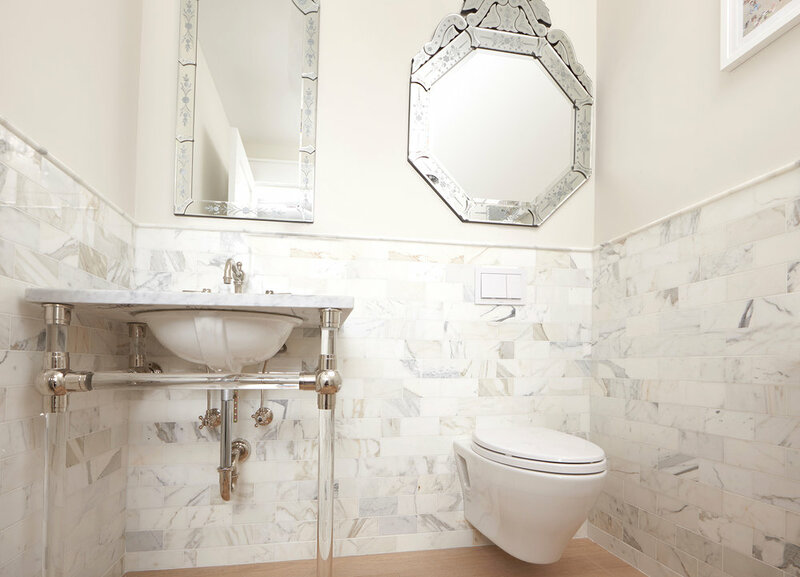 The powder room incorporates Calacatta Gold marble tile and Restoration Hardware Gramercy Washstand. A custom vanity was tailored for the master bath with a Carrara marble slab, accompanied with Cararra marble wall tile, Statuary marble floor tile, and Restoration Hardware Astoria recessed medicine cabinets.